Disclosure: This post is sponsored by Fireclay Tile. All opinions are my own and always will be! Thanks for supporting the content that keeps Jojotastic going. 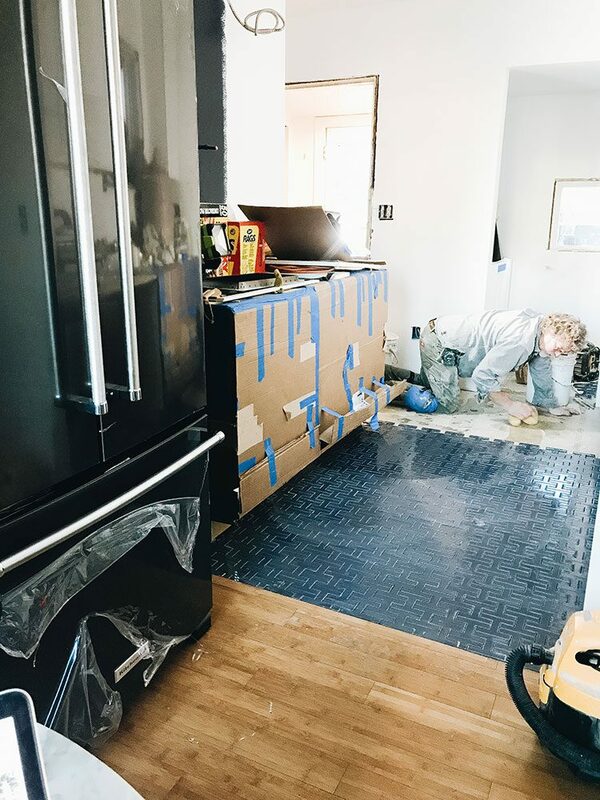 After last week’s kitchen renovation update about the cabinets, it’s time to share even more progress… we officially have a tile floor! For the most part during this renovation, Sean and I have been able to do the work either ourselves or in tandem with our contractor (more on him to come…). But tile is a totally different story. I feel like we could have handled a straightforward tile shape, like a subway. But I had to be fancy and choose the Chaine Homme from Fireclay Tile! So we brought in a tile master named Dan to install it. As you’ll see in the video, Dan is a trip. You may remember from our Materials Selection post just how special our Fireclay Tile is. During the design planning stages with Sarah of Room for Tuesday, I went back and forth on this choice. I was scared of committing to a tile that would be too much of a statement, but then I also wanted something that would be a WOW moment. And not gonna lie… I got a bit indecisive about it. At one point, we had decided on the Chaine Homme, then I changed my mind and ordered even more tile samples. While they were beautiful, they just weren’t the tile. My heart was simply set on the Chaine Homme and it’s H-shaped, interlocking geometric design. First, I loved how handsome, yet modern it felt. Second, the scale of each tile was too perfect for our space! And lastly, I couldn’t miss an opportunity to pay homage to my grandfather, Harvey. I am forever grateful to him for helping me purchase my first home and every renovation is made with him in mind to honor his legacy and spirit. Not only would he approve of our kitchen renovation, but he’d be so damn proud of how we’ve taken on this project. 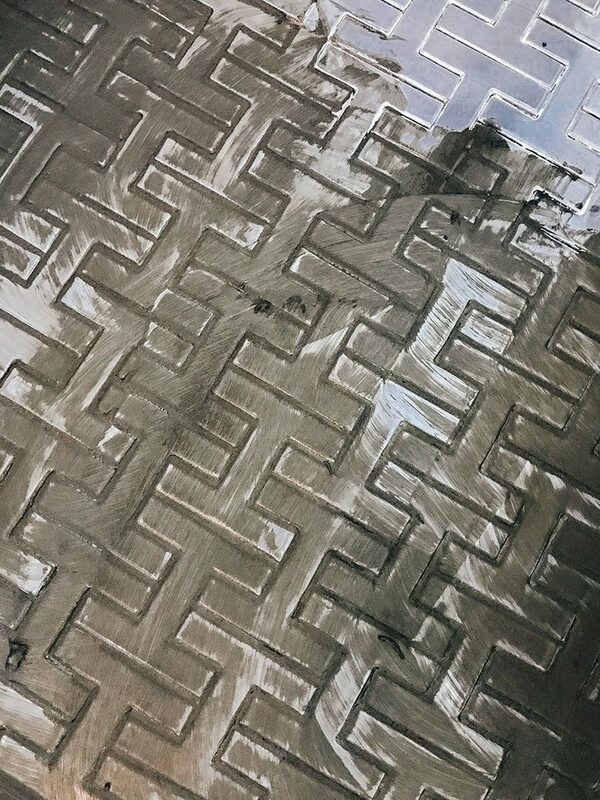 In terms of the Fireclay Tile itself, I am totally in love with the handmade nature of our floor. Each piece is handmade and made with over 50% recycled clay. While we were installing the tile, it was truly amazing to open a box and discover that each one was unique. Almost like they each have their own personality! 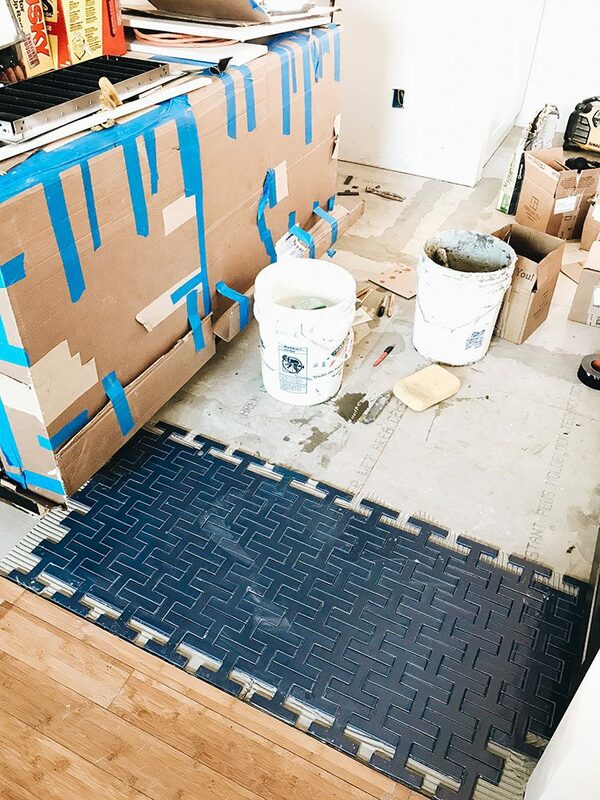 I went into our tiling knowing that it will never be 100% perfect — and that’s exactly what I love the most about it! The color we chose is called Slate Blue. It has a glossy finish, which we chose to help bounce light in our still somewhat dark kitchen. 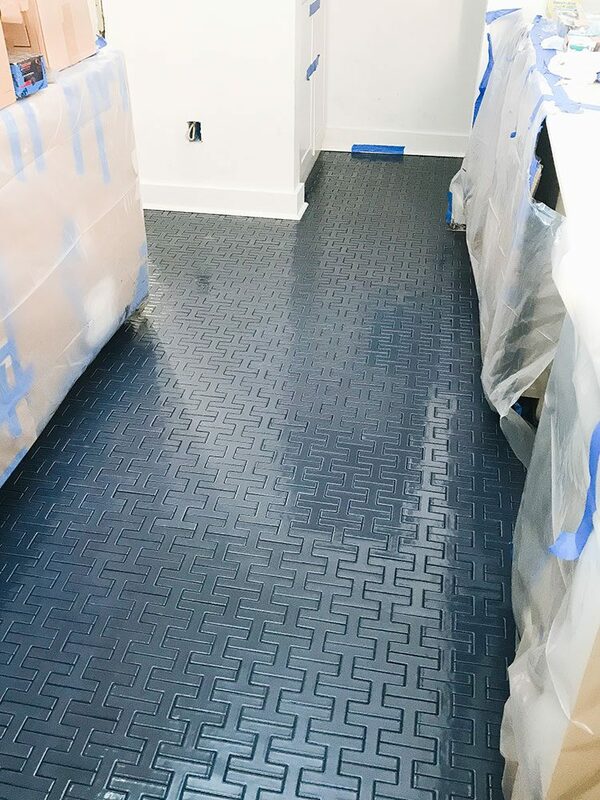 Typically, it isn’t recommended to install a glossy floor tile in a kitchen because it could be slippery. However, because the Chaine Homme is smaller in scale and has more grout joints, it worked perfectly for our kitchen renovation! I was also totally unprepared for how stressful it could be to choose a grout color! Initially, Sarah and I had wanted a light grey. But once I started playing with the grout samples, we totally changed directions. I fell in love with the idea of a black (or actually dark charcoal) grout. Not only would it show fewer stains in the future, but it tied in the lower cabinets in a beautifully cohesive way. Even though we got a little bit of pushback from Dan the Tile Man about black grout and how difficult it is to work with, we went with it. And I am SO happy that I listened to my gut and pushed for it. The floor is just beyond perfect and even better than I could have imagined! 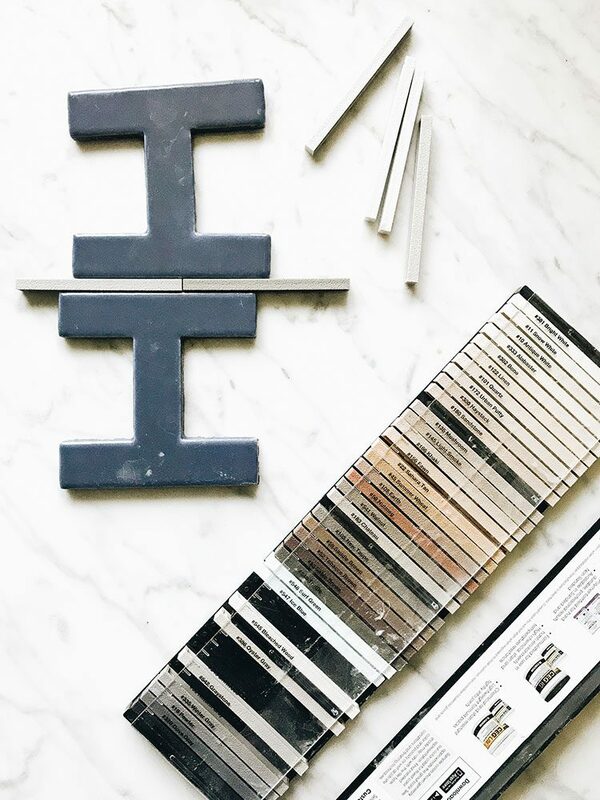 Stay tuned for even more updates to come + be sure to catch our behind the scenes on Instagram. photography & videography by Jojotastic.